The only significant monthly data reported in the last week was the ISM services index, which rebounded slightly. Its components were mixed, but all were positive. With one exception, the high frequency weekly indicators show an economy completely dead in the water, neither rising nor sinking, but just barely positive or negative. The most negative statistic continued to be gasoline usage. Oil finished at $87.24 a barrel on Friday. Gas at the pump rose $.04 more to $3.67 a gallon. Gasoline usage was -3.4% lower than a year ago, at 8956 M gallons vs. 9263 M a year ago. With the exception of a few weeks, gasoline usage has been negative for months. Because of the divergeance between Brent and West Texas crude, it may be better to compare gasoline prices as a recession indicator. While WTIC is about $7 below the historical recession trigger level, gasoline prices compared with hourly earnings may be about $.25 to $.30 above that level. 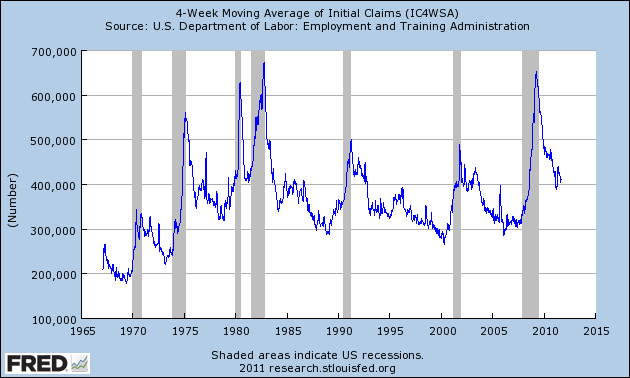 Initial jobless claims continued their recent range. The BLS reported that Initial jobless claims rose 5000 to 414,000. The four week average increased to 414,750. 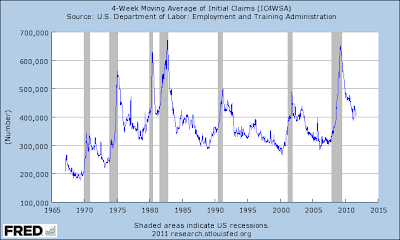 Jobless claims still remain lower than for all but two months in the last 3 years. The Mortgage Bankers' Association reported that seasonally adjusted mortgage applications increased 0.2% last week. For the fourth week in a row, the YoY comparison in purchase mortgages was negative, down -13.5% YoY. Refinancing decreased 6.3% w/w despite near record low interest rates. Refinancing is nevertheless relatively higher recently with sharp decline in interest rates. Because of the low rate of housing purchases, the YoY% decline in purchase mortgage applications does not have nearly the impact it would at higher volumes. Weekly BAA commercial bond rates were flat at 5.40%. Yields on 10 year treasury bonds decreased .02% to 2.17%. This indicates a continuing slight increase in the relative distress in the corporate market, further indicating increased relative fear of rising corporate defaults. The American Association of Railroads reported that total carloads decreased -.5% YoY, down 7500 carloads YoY to 534,100. Intermodal traffic (a proxy for imports and exports) was, unusually, also down 3100 carloads, or- 1.3% YoY. The remaining baseline plus cyclical traffic was down 1300 carloads, or -0.4 YoY%. Rail traffic has been negative YoY for 5 of the last 9 weeks. Using the breakdown of cyclical vs. baseline traffic from Railfax, baseline traffic was down 6900 carloads, or -3.5%YoY, while cyclical traffic was up 5600 carloads, or +5.2% YoY. YoY weekly median asking house prices from 54 metropolitan areas at Housing Tracker showed that the asking prices again declined -2.0% YoY. This is the smallest YoY decline in the 5 year history of this series (YoY measurements were possible beginning in April 2007). The areas with YoY% increases in price also remained at 13. The areas with double-digit YoY% declines declined to only 3 (Boston, Chicago, and Tucson, AZ). The American Staffing Association Index increased one point to 88. This series has stalled at the 87-88 range for over 2 months. Adjusting +1.07% due to the 2011 tax compromise, the Daily Treasury Statement showed that for the first 5 days of September 2011, $42.3 B was collected vs. $42.0 B a year ago, for an increase of $0.3 B. For the last 20 days, $127.0 B was collected vs. $125.1 B a year ago, for an increase of 1.5%. This is a weak gain. 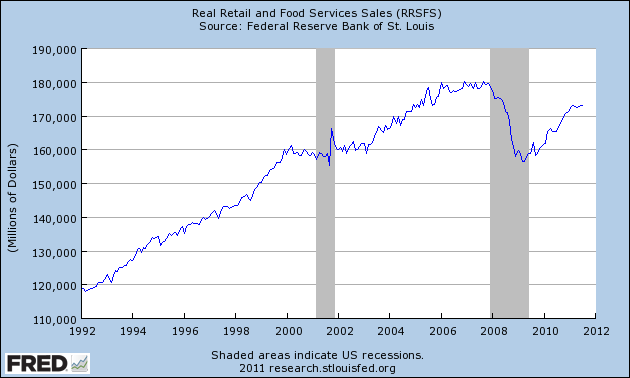 Retail same store sales continue to be positive though not as much so as recently. The ICSC reported that same store sales for the week of August 27 increased 2.7% YoY, and decreased -0.7% week over week. Shoppertrak reported a weak 1.7% YoY increase for the week ending August 27 and a WoW decrease of -1.6%. 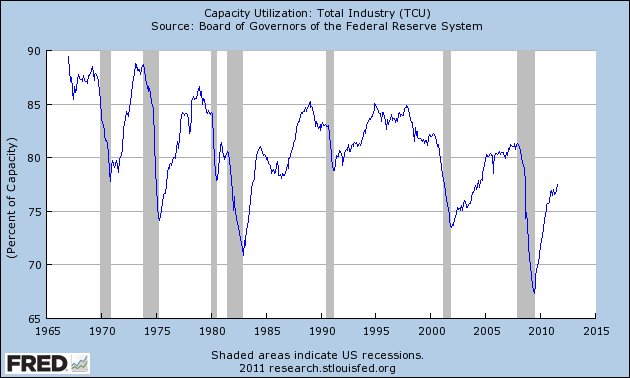 Money supply -a leading indicator - continued to surge. M1 was up 1.0% for the week, and also increased 3,0% m/m, and 20.5% YoY, so Real M1 was up 16.9%. M2 increased 0.3% w/w, and also increased 1.7% m/m, and 10.4% YoY, so Real M2 was up 6.8%. The YoY increase in both M1 and M2 continue near historic high levels. While I believe Scott Grannis and Kash Monsori are correct in identifying European panic as a likely source for this increase, which means it is "hot money" that could decrease just as quickly, nevertheless I do not believe that this means that "this time it's different." Over a very long history an increase in real money supply has been a good thing and in my opinion should be regarded as such now. Most of the weekly data has turned slightly negative or mixed. Additionally, while I don't have current plans to track it indefinitely, it is worth noting that the daily Gallup consumer confidence report, which first and most strongly showed the collapse of consumer confidence during the last month of the debt ceiling debacle, remained generally flat this week, having improved somewhat from its early August bottom. Consumer spending remains positive YoY in that daily Gallup poll. Another component of the Weekly Indicators, besides money supply which I discussed yesterday, is the Mortgage Bankers' Association's report on purchase mortgage applications. This gives us a high frequency read on housing sales. I've been reporting this in terms of week over week and YoY %age moves. In the last few weeks, I've been very concerned that it had turned down again, coming in not just lower week over week (to the tune of over 10% in just two weeks) but also turning negative YoY again on the order of more than -5%. On further thought, however, I think I've been a little too pessimistic because I haven't taken into account the absolute level of such applications. The above graph is based at zero and each horizontal line is worth 100 on the scale. As you can see, at its peak the value of purchase mortgage application was between 450 and 500. In the three years between mid 2007 and mid 2010, the index fell by about 80 or 90 points a year. Since May of 2010, however, it has been varying between 160 and 200 - even with the recent decline. In other words, a 10% decline now, for example, is only equivalent to a 3.3% decline when the index was at its peak. This in the graph above, the 5%+ YoY decline of the last month really does not violate the essential flatness in applications for the last 16 months. Put another way, while the decline is certainly not good, it doesn't seem to warrant quite the pessimism it has contributed to my outlook in the last few weeks. 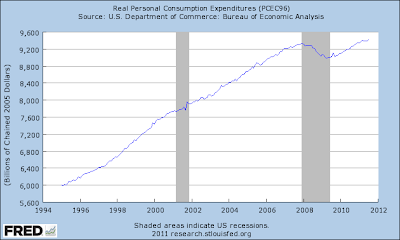 But I'd still like purchase applications - and monthly car sales, that other big consumer durable - to recover to their springtime level to be less concerned about the trend in the economy. Reports from the twelve Federal Reserve Districts indicated that economic activity continued to expand at a modest pace, though some Districts noted mixed or weakening activity. The St. Louis, Minneapolis, Kansas City, Dallas, and San Francisco Districts all reported either modest or slight expansion. Atlanta said activity continued to expand at a very subdued pace, while Cleveland reported slow growth and New York indicated growth remained sluggish. Economic activity expanded more slowly in the Chicago District and slowed in the Richmond District. Business activity in the Boston and Philadelphia Districts was characterized as mixed, with Philadelphia adding that activity was somewhat weaker overall. Several Districts also indicated that recent stock market volatility and increased economic uncertainty had led many contacts to downgrade or become more cautious about their near-term outlooks. Expansion is occurring at a "modest pace;" activity is "mixed or weakening;" growth is "slow." None of the adjectives used to describe economic activity are positive; they all indicate the economy is limping along, probably at just above 0% growth. Also note that increased economic uncertainty was now creeping into overall perception. This explains the big drop we've seen in overall consumer sentiment over the last few months and also highlights the impact of the budget debate on the populace. In short, the summation is extremely concerning. Overall consumer spending increased slightly in most Districts, but non-auto retail sales were flat or down in some Districts. Hurricane Irene evacuations also produced widespread retail disruptions in late August in the New York District, where activity had been close to or above plan in July before slowing somewhat in early August. The Minneapolis and Kansas City Districts reported moderate increases in non-auto retail sales during the survey period, and sales in the San Francisco District were mixed but up slightly overall. Retail sales were up single-digits from a year ago in the Cleveland and Dallas Districts, although Dallas reported no growth in sales since the previous survey period. Retailers in the Chicago District reported strong back to school sales, while Atlanta said growth slowed in retail sales. The Boston and Philadelphia Districts said sales were flat to down but with sizable variation across stores, while sales mostly weakened in the Richmond and St. Louis Districts. Sales of apparel and luxury items were characterized as strong in several Districts. The Boston, Chicago, Kansas City, and San Francisco Districts all noted sluggish sales of big ticket household items such as furniture and appliances, and contacts in several Districts thought that heightened consumer anxiety was weighing on sales. Contacts in some Districts continued to indicate profit margins were being squeezed by rising input costs, although grocers in the Cleveland District were passing cost increases through to customers. 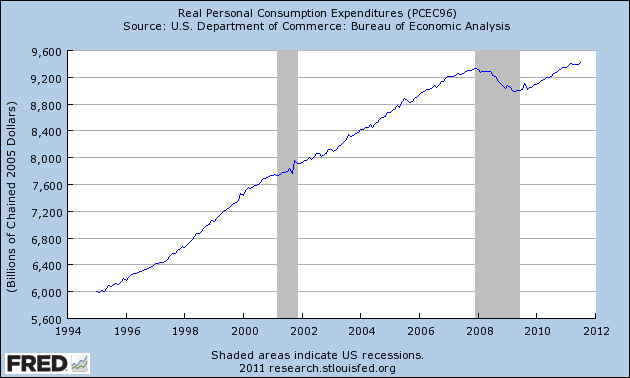 Like the macro summation, consumer spending is weakening or in one case (Dallas) not growing at all. Increases are "modest" or "up slightly." Big ticket items sold "sluggishly" indicating consumers don't want to spend a lot of money right now probably due to the heightened anxiety among consumers regarding the overall economic outlook. There is little positive in the above paragraph and much to be concerned with. 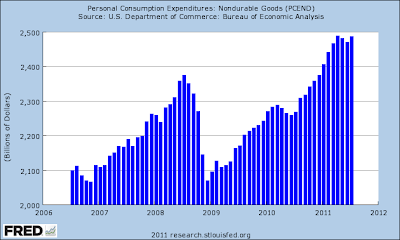 Considering that consumer spending is 70% of US GDP, this is not welcome news. Most Districts reporting on auto sales noted increases in activity, despite lingering supply disruptions for some Japanese nameplates. The Kansas City and Cleveland Districts reported especially strong sales of fuel-efficient cars, while luxury vehicles sold well in the Minneapolis District. High demand for used cars was reported in several Districts. The New York and Philadelphia Districts reported somewhat softer auto sales in July, attributed in part to continued supply disruptions, although sales firmed somewhat in August. Tight vehicle supplies were noted in some Districts, and the San Francisco District noted ongoing shortages of Japanese nameplates. Auto contacts in the Dallas District believed the supply issues from Japanese manufacturers should be resolved by the end of September. Auto dealers in several Districts were optimistic about future sales, although contacts in the Philadelphia District said uncertainty clouded the outlook. The Cleveland District noted some easing in auto credit restrictions, and New York said both retail and wholesale auto credit conditions were good. Auto sales are a paradoxical bright spot. My guess is three things are happening. First, many people have been holding onto cars longer, so they are now is a position where they literally have to get a new car. Secondly, there is the pent-up demand effect caused by the Japanese caused slowdown earlier this year. Third, it appears the people are now economizing their cars, switching to more fuel efficient cars at the expense of gas guzzlers, anticipating this will save money in the long-run. Nonfinancial services activity edged higher in most Districts, although Minneapolis and Dallas characterized growth as flat or steady, and New York said conditions deteriorated. Richmond, St. Louis, and San Francisco reported generally solid demand for health-care services, although Richmond noted lower occupancies at senior care facilities due to difficulties among potential residents in selling their homes. Software and information technology firms in the Boston District reported mixed activity since July but expected to return to previous strong growth patterns by late 2011. The San Francisco District reported expanded sales for technology service providers due to heightened demand for software, e-books, and mobile applications. In contrast, an information technology contact in the Minneapolis District noted a decline in sales as a result of reduced demand from the government and financial services sectors. As services make up the larger portion of the US economy, the above news was also good, as it indicates services are picking up some of the slack caused by the drop in manufacturing. Only two districts reported flat or steady sales and only one showed deteriorating conditions overall. The above information is consistent with the latest ISM report, which showed services as expanding slightly, but not aggressively. Manufacturing conditions were mixed across the country, but the pace of activity slowed in many Districts. The New York, Philadelphia, and Richmond Districts reported declining activity overall, and contacts in the Boston and Dallas Districts noted slowing demand from European customers. Cleveland said factory production was stable, and manufacturing activity in the Atlanta and Chicago Districts grew at a slower pace. Minneapolis, Kansas City, and San Francisco reported slight expansions, and St. Louis said activity continued to increase and that several manufacturers planned to open plants and expand operations in the near future. Most manufacturing contacts were less optimistic than in the previous survey; however, future capital spending plans were solid in a few Districts. This is consistent with two events. First, an overall US slowdown, as evidenced by the downward revision to GDP over the last few months. Second is the overall economic slowdown across the world, where we've seen developing countries (such as China, India and Brazil) engage in a tightening policy to slow inflationary growth in their respective countries. Overall, the report shows an economy that probably has just enough activity to keep growth positive -- but just barely. 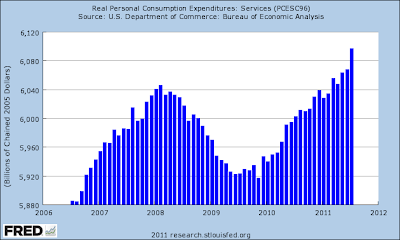 Between big tickets auto sales and services we have positive growth, and it appears consumers are spending just enough. However, manufacturing's slowdown is a concern, as this was a primary growth driver over the last two years. In addition, services are picking up some of the slack, but they are also just above stall speed. Yesterday, the euro -- which was already below the 200 day EMA -- broke below technical support in high volume. The primary reason for this move the the ECB kepts rates at 1.5%, but Trichet issued a cautionary description of the EU situation, leading investors to sell the euro. The EMA picture is still jumbled, as they are in a very tight range, but the gap lower a few days ago combined with the fundamental events makes this a very important move. Ideally, we'd like to see the security rally into previous support to retest those levels and then move lower to make sure this is a shorting situation. In contrast, the dollar is the clear beneficiary of the euros move lower, as evidenced by the UUP gapping higher on big volume. However, this security is still below the resistance areas established in late May. Oil is in a clear downtrend. It fluctuated around the 200 day EMA for three months while the EMAs slowly drifted lower. Prices dropped hard at the beginning of August, but have since formed a rising triangle pattern with resistance right around 90. While the MACD is rising, it is still negative, taking away from some of the overall bullishness of recent price actions. Also note the 200 day EMA is now in a downtrend and the shorter EMAs are below the 200 day EMA. 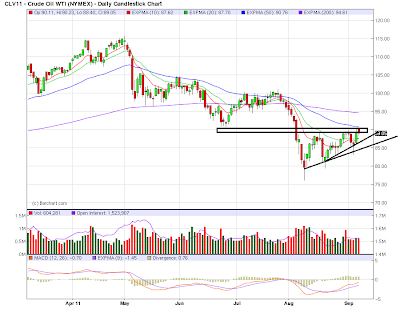 Even if prices move through the 90 price level they still have to contend with the 200 day EMA as upper resistance. Also remember, that should the dollar rally in reaction to the euro's drop, commodities will probably take a negative hit. Republicans striking a new tone? An initial note: I read all of the comments. I don't always respond because frequently I simply don't have time. As it is I probably only write about half the posts I'd like to. In that vein I haven't been able to flesh out my take on the whole "double dip" issue, which basically is that the most likely near term scenario is that we are going to have just barely positive growth, or just barely negative contraction. While the former is certainly preferable, I can't see getting too excited about which semantic term winds up being the most accurate. (As to why, see Dean Baker this morning). As we surely already know, not all recoveries and not all recessions are created equal. Anyway, I wanted to address briefly a matter that came up in the comments. As you can see, in the last couple of months, both real M1 and real M2 have been soaring. In the last few weeks (over a month after it became apparent in the weekly data), there has been a debate about the meaning of this trend. I've referred to it as a "panic" by which I mean an emotional move, not necessarily negative. There is finally some commentary, centering on the idea that M2 growth reflects panic and a desire for cash. Putting aside the complete lack of correlation between M2 growth and any measure of panic, you might expect panic to show up in brokerage accounts (MZM), bond purchases, or gold purchases rather than M2. This is another example of where some are willing to throw out the entire body of Milton Friedman's work because they think that "this time is different." Do such pundits really believe that there were no other "panics" in the history of the M2 series? My advice is to ignore cheaters who spin current data without reviewing the entire series. The issue is the surge in the M2 measure of money supply .... [I]f the extra growth in the money supply results from extra demand for money, then this is ... a reflection of some other problem that is driving people to increase their holdings of dollar liquidity.... [I]t appears that the rapid expansion of M2 in recent months is part of the fallout of the eurozone sovereign debt crisis that is in full bloom. Money is fleeing Europe and seeking safety in the U.S.
European banks are shifting their cash assets out of European banks and putting much of them into US banks. (An interesting question is what European MFIs have done with the remaining money they've withdrawn from the European banking system... but that's a story for another day.) This has happened at a significant rate, with a net transatlantic flow from European to US banks that probably totals close to half a trillion dollars in just six months. If you're wondering exactly who has been the first to lose confidence in the European banking system, look no further. It seems that at the forefront is the European banking system itself. I respect Kash's work; but it's my view that he jumped to some inaccurate conclusions on European bank flows. The data demonstrate that European bank branches in the U.S. are more likely moving capital back to their local branches, rather than into their U.S. branches. Wilder views the surge in money supply recently as simply the outcome of QE2. It is generally thought that the effect of money supply is seen with a lag, on the order of a full year. If so, then the move into M1 and M2 money in September and October 2008 was both a coincident reflection of panic, and a leading indicator of the recovery that began in the 2nd half of 2009. Panic or not, I see no reason to partake of that most common route to error, that "this time it's different." Why Aren't We Creating More Jobs? This has been a central question for the last year+ -- why aren't we creating any more jobs? I think the answer is really that there are multiple reasons. 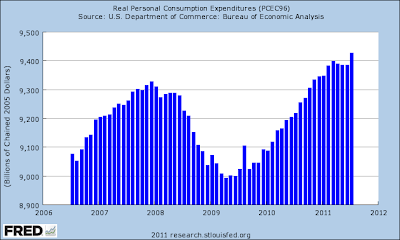 Real PCEs dropped hard during the recession and have only recently gotten above pre-recession levels. 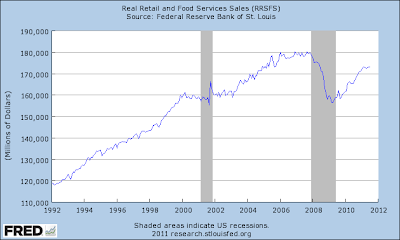 Real retail sales are still below pre-recession highs, so there is still ground to make up. In short, while the consumer is spending, they are still doing so at weak levels. 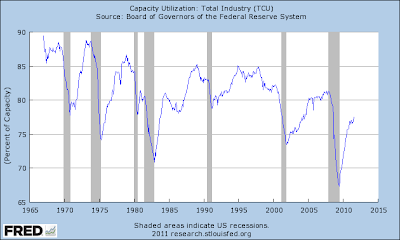 Capacity utilization crashed to its lowest level in 40 years during the recession and is still at weak levels. This means there is still idle capacity that can be brought on line to satisfy an increase in demand at the expense of hiring additional employees. Economic uncertainly is a big issue as well. When you talk with CFOs etc.. sometimes they will use the word "visibility," as in, "we lack economic visibility right now." This phrase simply means they can't say with confidence what will happen in the next 6-12 months. Now, while no one can say with certainly what will happen at any time, there are times when you can say, "things stand a better chance of being better in 6-12 months" with a higher degree of certainty than others. Now is not a time when there is any visibility as to what will happen. Congress is a mess, growth is already slow, the EU situation is terrible, consumer confidence is low.. you get the ideal. At times like this, no one can make a reasonable guess as to what will happen in the near term. As such, this is not a good time to be adding new employees. Third, most critical attention concerns new laws such as the Affordable Care Act or Dodd-Frank. But potentially more important is the way in which existing rules are interpreted, enforced and litigated. Here are a few examples. The Interior Department has canceled offshore leases that Exxon claims may yield billions of barrels of oil. Exxon is suing, claiming that Interior deviated from longstanding practice which was to extend such leases as a matter of course. Immigration and Customs Enforcement since 2009 has been auditing employers and forcing them to fire workers they can’t prove are legal. This represents a shift from its traditional approach of deporting workers but leaving firms alone. The Food and Drug Administration has become stricter and more capricious about approving medical devices. Michael Mandel highlights the trend with a terrific case study here. Finally, there’s the practice by Fannie Mae and Freddie Mac to force banks to take back mortgages they originated during the boom and which have since gone bad. Fannie and Freddie have always had the right to do this but have only exercised it since the bust, I am told. There is merit to the government’s position in each case but surely the effect of each is, on balance, to deter investment, hiring and lending. By how much, I don’t know. The above passage highlights the fact that there appears to be a regulatory tightening going on right now. Put another way, the government is taking a more active role in enforcing certain laws and statutes. From personal experience (in my business practice) I can tell you the IRS is certainly being far more aggressive in dealing with tax issues. While a reader can correctly say, "it appears they are simply enforcing laws that are already on the books -- isn't that what they were supposed to be doing?" that misses the point. The prevailing environment has been one of non-enforcement, so a movement to enforcement changes the dynamic in a big way. All of the above factors -- weak demand, low utilization, economic uncertainty, different enforcement environment -- add up to a very challenging environment for companies. Throw in still strong productivity gains and you get a potent environment in which hiring the last thing on the minds of most businesses. Gold is looking like it wants to consolidate at these levels. After hitting a bit above 184, prices dropped lower on strong volume, printing very strong bars. Prices again rallied, but notice the weakness of the rally -- prices moved sideways for two days printing a spinning top and hanging man candle before vaulting higher to previous levels, and then selling off again. I've drawn the fib levels and a few lower levels as possible support areas. I'd call support at 175 (previous low and 10 day EMA) and 170 (Fib level). The daily chart clearly shows a major trend break. The 10 day SPYs show consolidation between the 114.5 and 123.5 levels. The last two days have seen some strong advances; Tuesday's rally lasted nearly the entire day and ended on a high note, while yesterday saw prices gap higher and then rally into the close -- with a nice volume spike at the end of trading. However, price need to advance through the 123.5 level for these rallies to amount to something in the long term. Finally, consider the following Treasury market charts, going from the shorter to the longer ends of the curve. The farther you go on the curve, the more of a bump we've seen over the last few trading days. But even this far out, real yields are negative, which appears to be constraining traders from sending the market higher. The above charts show all the major average ETFs and the transports. All confirm that the two year bull run is over, as all have broken uptrend lines in place for over two years. Looking deeper into the "regulations are killing job growth" argument. How much copper is being stored off market? After stalling for the last four months (for the entire second quarter), real PCEs popped higher last month by .5%. But non-durable goods are still mired in a tight range. Services, however, saw a nice bump as well. Considering these comprise about 65% of PCEs, this is an important increase. PCEs in the second quarter were stagnant -- as evidenced by the near level position they were in for the last four months. However, at the beginning of the third quarter, there is a good bump. Given the overall weakness we've seen in the other numbers (especially employment) this data series is in danger of being seriously weakened going forward -- that is, another round of stagnation much like the second quarter is a more than slight possibility. But at least the third quarter GDP number has a nice jump coming out of the gate. Today's ISM Services report was also good. "The NMI registered 53.3 percent in August, 0.6 percentage point higher than the 52.7 percent registered in July, and indicating continued growth at a slightly faster rate in the non-manufacturing sector. The Non-Manufacturing Business Activity Index decreased 0.5 percentage point to 55.6 percent, reflecting growth for the 25th consecutive month, but at a slower rate than in July. The New Orders Index increased by 1.1 percentage points to 52.8 percent. The Employment Index decreased 0.9 percentage point to 51.6 percent, indicating growth in employment for the 12th consecutive month, but at a slower rate than in July. The Prices Index increased 7.6 percentage points to 64.2 percent, indicating that prices increased at a faster rate in August when compared to July. According to the NMI, 10 non-manufacturing industries reported growth in August. Respondents' comments remain mixed. There is a degree of uncertainty concerning business conditions for the balance of the year." The report also showed a majority of industries expanding verses contracting (10 were expanding; were contracting). There are plenty of reasons to be concerned right now: manufacturing is contracting, employment is in poor shape and Congress is a mess. However, the two data points above represent wide swaths of the economy and their positive readings indicate all hope is not lost. Yesterday, there were two important stories. First, the ISM services printed better than expected. This provided much needed enthusiasm. Secondly, the Swiss National Bank established a hard franc/euro exchange rate, essentially lowering the value of their currency to increase the competitiveness of their respective businesses. Notice the incredibly large spike in the dollar index yesterday on very large volume. The overall move was 1.65% -- a large move for a currency. The dollar is still trading in a range between 20.9 and 21.9, so the overall effect doesn't indicate a major change in the market's tenor -- yet. However, this is the kind of move that can fundamentally change markets, so keep your eyes open. But for that to happen, the technicals would have to change, and considering the EMA picture is still bearish, we'll have to wait and see. Conversely, the euro is at the bottom of a trading range, just barely hanging on to technical support. But yesterdays move also sent the euro below the 200 day EMA on high volume, adding weight to the events. But, the EMA picture is still very jumbled, with the shorter EMAs in a very tight range, so, like the dollar, we'll have to wait and see what happens next. Just for kicks, I'd seriously think about shorting around 138.5 if confirmed on volume and further deterioration in the fundamentals. The ISM reading added some strength to the market. Notice the next day-long rally and the fact the market ended on a high point on increasing volume. But one days action does not a bull market make, as the daily chart is still negative. The EMAs are bullishly aligned and no rally in the last few months have been able to maintain momentum. And while the intra-day price action was good, the lack of volume is concerning, as it indicates that traders are less than enthused about the current market situation. I'm still expecting a retest of the 112 area at this point. Regarding the Treasury Market, Tim Knight over at Slope of Hope notes that the 10 year's yield is now below the levels seen in the financial crisis. 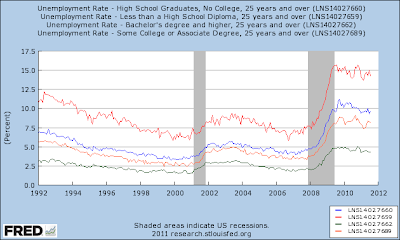 After last week's dismal employment report, I though a macro level view of the employment situation would be in order. So, let's see what the data says. Weekly initial unemployment claims are still hovering around the 400,000 mark -- where they have regrettably been for the better part of the last year. However, we haven't seen a large spike in this number, telling us we're not seeing a massive amount of firing -- or, more specifically, the level of firing associated with the start of a recession. Instead, businesses are letting go of employees at a pace that is slightly more than average. The above chart shows total nonfarm employment. 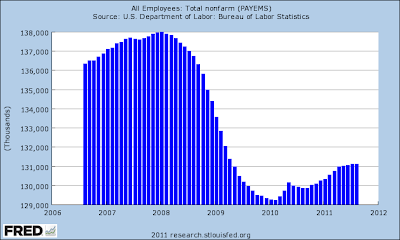 The chart tells shows massive job cuts during the recession. But most importantly, it shows that, while there has been some job growth, it has been nowhere near enough to pick up the slack of the job losses from the recession. It's also as though employers simply cut off 7%-10% of the economy and left it hanging. For me, the above chart is the most telling. 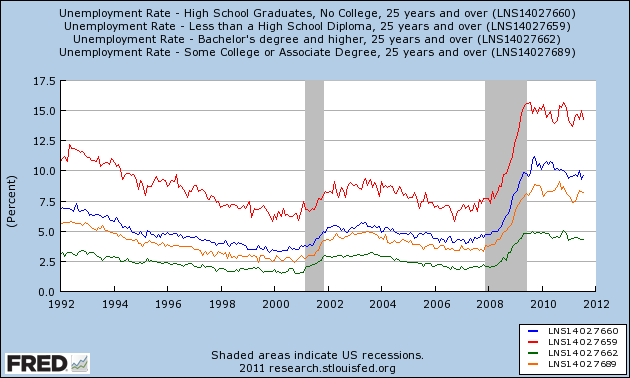 The lower a person's educational achievement, the higher their unemployment rate. Going back to the previous chart, it looks as though employers cut a lot of jobs where educational achievement wasn't required. Assuming that to be true, it also means the economy has a very large problem: bringing back those jobs probably isn't going to happen quickly -- if at all. The central problem is simple: while there is still a slight bleed in the form of job losses, there is little gain to offset those losses. Between being buried in work and feeling incredibly depressed about the overall political situation, I wound up taking a much needed break last week. And while I am back, I have to admit a feeling of complete and utter frustration with the situation in Washington. At time when the economy is teetering on the edge of a recession, we can point to Washington as being a primary contributing factor in our current economic malaise. It should come as no surprise that we started to get really dismal domestic numbers right around the debt debate flare-up. But that was actually not the beginning of what I noticed to be the complete degradation of our national political dialog. I think it was about a year ago when we had to live through the health care town hall debacle. It was during this time that I first began to seriously doubt our national ability to actually deal with a problem. It started with a protester who informed his Congressman to "keep the government out of my medicare." How on earth would you respond to that statement -- I mean, besides being utterly stunned by its sheer stupidity? How do you actually have a meaningful conversation about how to deal with a very complicated problem (such as health care costs) when people want you to somehow keep the government out of government insurance? Just when I thought our national debate could not sink any lower, we had the national debt crisis. This should have been a simple vote, nothing more. Instead, we had a group of people in Congress who actually thought it was a good idea to vote (or, more specifically, not vote) for a national default. To even think this is a good idea should demonstrate to anybody how completely debased out national dialog has become. The US yield curve is a fundamental component of international finance; to threaten it's viability in any way is to essentially invite the possibility of financial Armageddon not just for the US, but for the world. And yet, we witnessed a group of people who invited just that -- and in fact were egged on by a not inconsequential group of pundits who agreed that committing financial suicide was a good idea. And finally -- again, just when you thought we couldn't see a higher level of dysfunction -- we have the President's speech issue. The level of petty bickering that occurred over the jobs speech is embarrassing on an international level. On the one hand, we have a party (the Republicans) whose dislike of the president is obviously a seething hatred. They have even stated they will not vote for an extension of the payroll tax break that expires in December -- which would be an obvious breaking of their little Grover Norquist pinky swear on no tax hikes --- because the president is for it. That is beyond childish. On the other had, we have a president who is so completely inept and unable to actually accomplish anything that it really doesn't matter. Frankly, I don't think the president can make a peanut butter sandwich without screwing it up. Yet somehow he's going to propose a jobs plan and a deficit reduction plan within the period of a week (or maybe in the same speech). But now it's more than just taking government action off the table; it's that both parties have now proven they are utterly inept, albeit it in different ways. 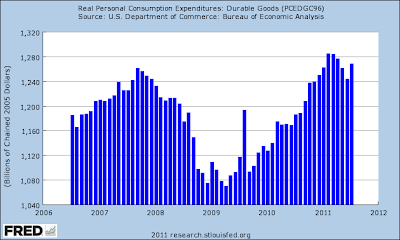 And frankly, that is deeply troubling, especially considering that the economy is now hanging on by a thread. I've seen many people comment that this is more of a Republican issue -- that is, that the Republicans are more to blame than Democrats. I would respectfully disagree with that statement. While the latest Republican bunch in Congress is clearly hyper-partisan and hell bent on doing everything they can to derail the President, I would ask this: please list 5 points that outline what the Democrats plan is. You can't, because no one really knows. I've seen a bunch of trial balloons floated and ideas bandied about, but I have yet to see a concrete list of points that all Democrats are rallying around in any meaningful way. And that -- in addition to utterly incompetent leadership -- is the central problem with the Democrats. The sharp slowdown in the euro-zone economy during the second quarter was due to a combination of government spending cuts and a drop in consumer spending, raising doubts about the wisdom of pushing ahead with austerity programs and further increases in the European Central Bank's key interest rate. I realize I'm preaching to the choir here, but news reports continually note that a decrease in government spending -- AKA austerity -- is a big contributing factor to the economic slowdown in Europe. I find it so completely amazing that no one in Washington is even thinking about major programs -- especially at a time of weak growth and negative real interest rates on the 10-year Treasury. This leads to an interesting idea -- is Congress hurting the economy? Democrats and Republicans say job creation is a top priority as they return to work this week, but there is a growing body of evidence that Congress is actually hurting the economy. A protracted budget stalemate in the first half of the year caused nervous federal agencies to sit on billions of dollars that should have been circulating through the economy. A vitriolic debate over raising the debt ceiling this summer spooked consumers, caused turmoil in financial markets and led to a first-ever downgrade of the United State's credit rating by Standard & Poor's. A spat over subsidies for rural air serices in late July idled airport construction projects across the country and threw thousands temporarily out of work for several weeks. Businesses that had to suspend their airport construction projects are still trying to recover from the disruption. With the SPYs, notice we have the big sell off on increasing volume, when prices moved through the 200 day EMA along with the other EMAs. We have since tested the 112 level, providing good technical support. Prices bounced higher, through the 10 and 20 day EMA, but have hit resistance at the 50 day EMA. Most importantly, the 200 day EMA is now moving lower, indicating the big, long-term trend is down, rather than up. This is a huge, fundamental change in the market. The 10 day, 5 minute chart shows that prices have moved through near-term support at 120.5 and 119.5, and have support at 117 with secondary support at 116. The long end of the Treasury curve has moved though resistance. However, neither the IEIs nor IEFs have followed suit. More importantly, notice the technical underpinnings of the TLTs -- the A/D and CMF show either stagnant or declining inward flowing volume and the MACD is weakening. My guess is the long end broke out because there is downward real room to run on the yield. One year inflation is running at 3.6%, meaning the 10 year now has a negative yield of about 1.5% with the 30 year now at -.3%. The point is real negative rates of return typically sour investors in an asset class, which makes me seriously wonder how much upside potential is left in the Treasury market. The equity markets are still incredibly weak; the deterioration of the fundamental situation is still a huge concern to traders, so I would not expect any strong moves to the upside. While I could see a quick spike up in the Treasury market, the fact that we're looking at negative yields is a pretty heavy drawback to additional upside moves. So -- where will the money flow? Expect gold to be the primary recipient of a bullish drive. Notice the continued upward move over the last year, with a bullish EMA picture. The A/D and CMFs show continued moves into the security, and the MACD has retreated a bit to allow for further advances. I would expect GLD to continue moving sideways for the next week at least as it consolidates gains, but I don't see a major sell-off in the current environment.